It is not really new to me to do online shopping on Multiply and have it delivered at my sister's address in Ph, and this usually makes my luggage already half-full everytime I come back home! One of my great purchases during my last trip in Manila is a Synthetic Kabuki Set from CHIC COSMETICS! 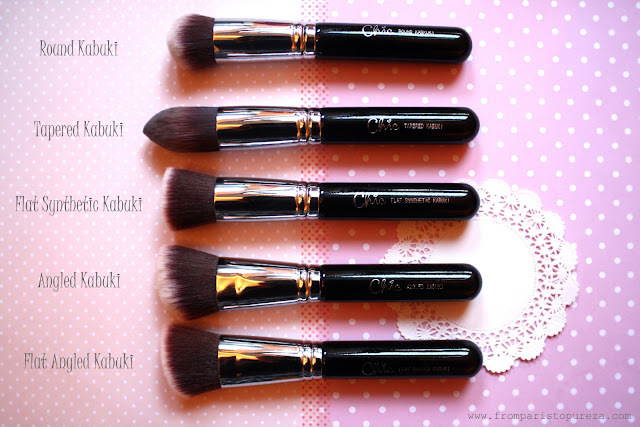 But what is a Kabuki brush? A kabuki brush is a makeup brush with a short flat head and a short stem. The brush head is usually rounded or flat, with a curved edge. The name kabuki comes from a style of Japanese theater defined by actors who wear heavy, stylized makeup. See? Another makeup trivia! *wink* And traditionally, the head of a kabuki brush was made of soft, semi-rigid animal fur, most commonly goat hair. These days, they often are made of Taklon or another synthetic fiber. Round Kabuki : What is it for? Ideal for applying mineral or liquid foundation especially onto round areas of the face (under the eyes, around the nose, around the mouth, neck area) How it works? The expansive head allows all-over application. It fits seamlessyly into contours and blends with ease. Tapered Kabuki : What is it for? Perfect for applying cream and liquid foundations onto the harder to reach contours of the face. This brush can also be used for contouring defined areas of the face. How it works? The flat, tapered point gives you more concentration of the color giving the entire face a sculpted look and a deeper hit of blush. Flat Kabuki Brush : What is it for? Ideal for applying liquid or cream products to the face. It can also be used to apply your face primers. How it works? The secret is in the flat end of this brush, which allows you to apply a color right where you want it, it gives a professionally sculpted look. Angled Kabuki : What is it for? It can be used for buffing cream blush or for highlighting and contouring. How it works? The angled shape picks up on the contours of your face with strategically placed slanted bristles allowing you to apply where you want it. It fills in contours so your cheekbones will really pop. Flat Angled Kabuki : What is it for? 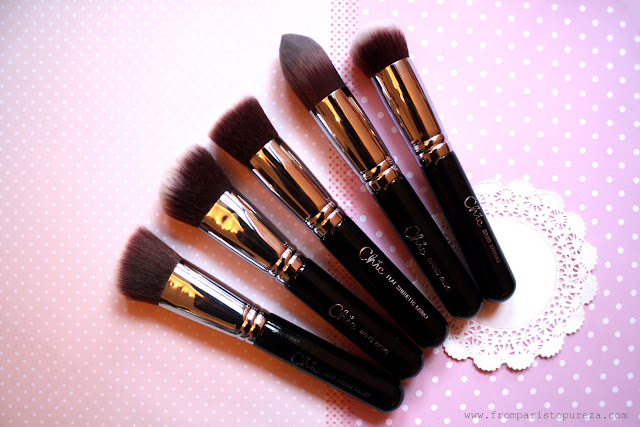 This brush works very well in applying product to the cheekbones and the nose area. How it works? The flat angled end precisely define the cheekbones, with blush, bronzer or contour color. What I love most about this brush set? These are Kabuki brushes with bristles made of synthetic fibers, not animal hair... Yes, let's focus on quality products that are cruelty-free and eco-friendly. 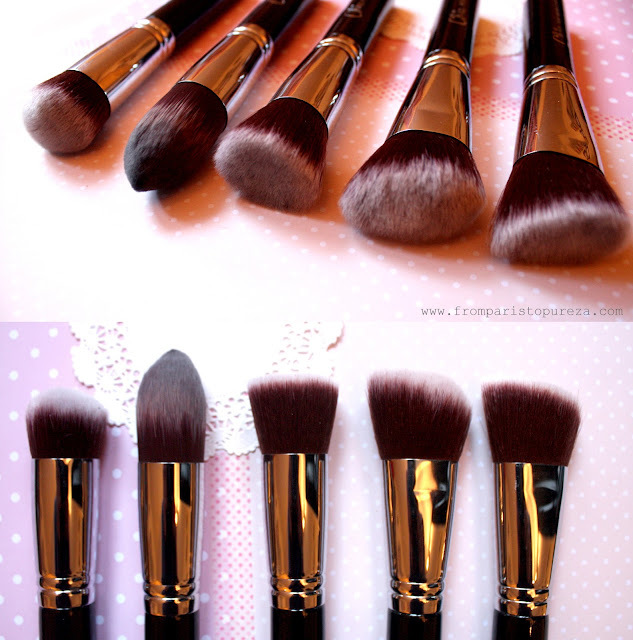 And not to mention that these brushes look like Sigma brushes but just a fraction of its price! Now I just need to wait for them to release an Eyeshadow Brush Set! Exciting! Just to share some love, check out Chic Cosmetics, they are offering 20% off their products until end of February!